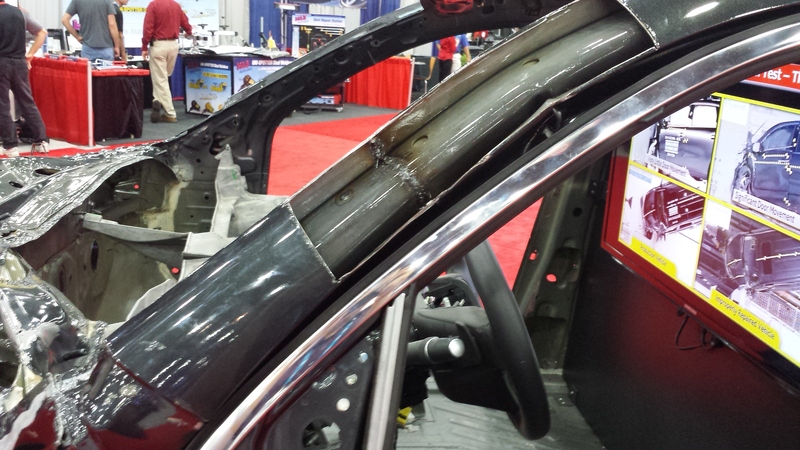 Honda is showing off another badly repaired vehicle, this time to demonstrate why auto body shops have no business sectioning an ultra-high-strength door ring unit. The automaker, which last month released a video of a totaled car which found its way back onto the street with a pretty appearance but serious internal damage, showed off two versions of a 2014 Acura MDX at the July 2015 NACE in Detroit. Both had been run through the equivalent of an Insurance Institute of Highway Safety small-overlap crash test, a 2012 safety standard which seems to have demanded greater effort from OEM engineers. The 2014 MDX model year has achieved “good” ratings in all IIHS safety tests and an “advanced” front crash protection rating with optional features for an overall Top Safety Pick+ from the entity. 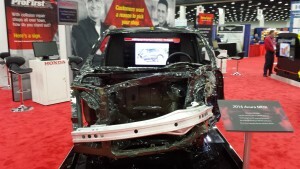 One half of Honda’s ProFirst booth at NACE contained a factory MDX put through the actual IIHS crash test, which bangs the driver’s side of the car into a small surface at 40 mph. The front of the MDX is a mess, but the driver’s-side door still opens fine, and Honda staff indicated it delivered the safe crash intended by the OEM. This was likely in part because of the 1,500-megapascal, ultra-high-strength-steel door ring, a single unit including the A- and B-pillars, roof rail and sill. The 1,500 MPa steel is light but seriously strong. Tobie joked that hitting it with a hammer felt “like whacking an anvil.” However, it demands specific repair procedures, in part because of its sensitivity to heat. The IIHS won’t let you use their testing facility whenever you want, and so the test on the repaired MDX was done by Exponent to what Honda said were IIHS specifications. “We had no idea what was going to happen,” Honda collision instructional designer Chris Tobie said. It involved an MDX which had had received improper repairs to the passenger-side door ring. Honda mimicked the same bad repairs on the driver’s half of the car so the test could be conducted on an apples-to-apples basis. These isn’t some obscure point of collision repair. Honda is very clear with a “For the love of God, don’t section our door ring” message in its MDX repair procedures, putting it in a box titled “Important Information” in an August 2014 Body Repair News document free to the world. This panel is made of Ultra High Strength Steel (UHSS/1,500MPa/ USIBOR) and must be installed as a complete part. No sectioning allowed. Ultra High Strength Steel requires special welding equipment, procedures and settings. See the welding section of the appropriate body repair manual. Failure to use the proper equipment or follow the proper procedures can result in an unsafe repair. In general, you’re not supposed to be sectioning much of anything on the MDX at or below the UHSS threshold of 780 MPa unless it’s a mild steel (anything below 340 MPa under Honda’s definitions) floor/outer panel or Honda tells you to do it. The effects pointed out by Ledoux and Tobie were obvious. The driver’s door doesn’t open on the botched MDX, meaning that the “fire department’s going to be yanking you out,” Ledoux said. There’s also greater damage to the body itself. Finally, the repairer’s welds on the sill area splits at the point where the door ring was sectioned; the factory welds behind it hold. 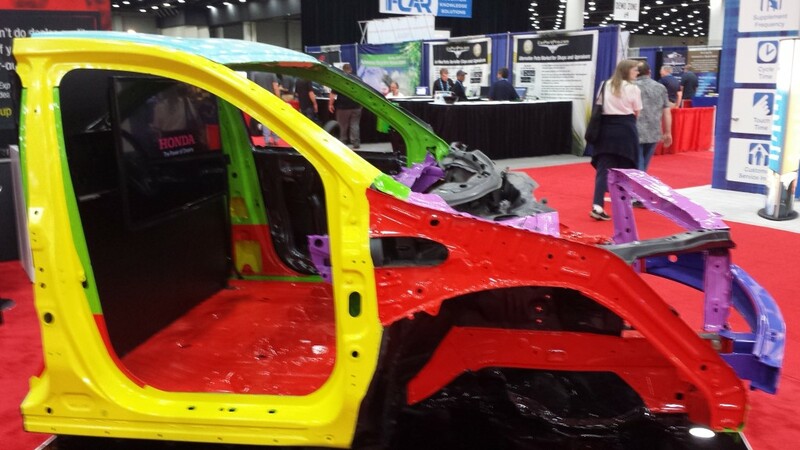 Last year, Honda showed off the factory MDX, but auto body industry members still were skeptical about the requirement that the door ring must be replaced entirely. So the OEM brought the misrepaired MDX along for the show this year. “The difference is pretty staggering,” Tobie said. Tobie said Honda hadn’t tried to intentionally crash a vehicle which had been fixed to OEM specifications, but “we’re confident” if technicians follow body repair manuals, the fleet will perform as intended. The actual research to determine the procedures is done in Japan, according to Tobie.